Mention data silos (separate data, databases or sets of data files that are not part of an organization's enterprise-wide data administration) and the blood pressure of any self-respecting data quality grafter will rise. Data silos are unconnected to data elsewhere in an organisation and thus are unable to share common types of information, which may create inconsistencies across multiple enterprise applications and may lead to poor business decisions. One thing, though, that we need to think about: in almost all cases data is in an organisation to mitigate the work that that organisation does. 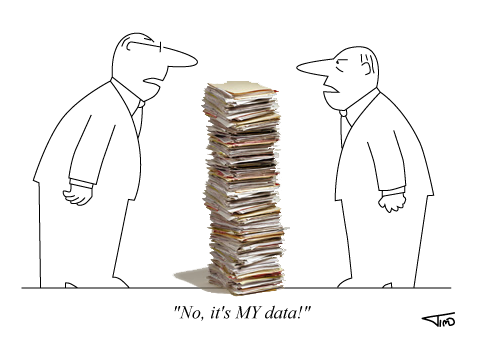 The organisation is not there to improve data quality. My proviso is that every organisation has an obligation to the data owners (usually its customers) to manage that data correctly. Thus any improvement in data quality must serve the organisation and its customers, not the data in and of itself. Data silos are inevitable, and that will never change. Organisation-wide data management systems are overcomplex and put too great a distance between the staff and the data they need. An employee's main focus is (or should be) to do the work that they are being paid to do as well as they can. If an organisation cannot provide ease of access to the tools that they need (hardly possible unless every member of staff has an accompanying IT employee at their beck and call) then they will reach for the tools that they can use - pen and paper, local spreadsheets, documents and database tables. Few employees (or work groups or departments) are going to wait around and do nothing while an attempt is made to hook their requirements into the cumbersome company database systems. So whilst a CEO depending on a central database system to provide his or her business intelligence may suffer from data silos (only may, because it depends what is being stored in those silos), the troops doing the real work find having the data they need at their fingertips a distinct advantage. I've been on both sides on the silos debate. I dug my heals in hard when attempts were made to integrate my data island into the company database because I knew it would not fulfil requirements, it would not enable me to do my job, it would be a waste of money, and I would not use it. I was right on all counts. At the same time I was trying to get the sales staff to give up their data for integration into a central marketing database. I failed for the same reasons (and because the staff were not going to give up the data which gave them the edge on their colleagues, improved their commission and enabled them to spend two weeks every year in the Caribbean as a reward from the company - incentives can be very bad for data quality). Naturally data silos in certain parts of a company are very damaging, without dispute. You can't have a call centre employee jotting a caller's details onto a piece of paper or into an Excel spreadsheet instead of into their centralised system, for example. But not all data silos are evil. As Jim Harris points out here, it's not so much having data silos that is the problem: it's what is done with that data. A much more open and accepting attitude to data silos is required, because we may wail and gnash our teeth as much as we like - they're not going to go away.